There’s going to be some disagreement, but on the whole most of the Eagles are easy to pin. – Kelce is a question-mark because of his injury, but he certainly has the potential to be an above-average center. – Celek is a bit of a fan favorite, but the fact is there is a clear upper-echelon among league TEs and he isn’t among them. – Foles is an unknown, but I see no reason why he can’t be at least a league-average QB. Obviously it’s hard to win if that spot isn’t green, but that’s a separate issue. – Kelly made some progress, but I don’t see his ceiling as anything higher than league average and think it’s more likely he ends up as a career depth player. 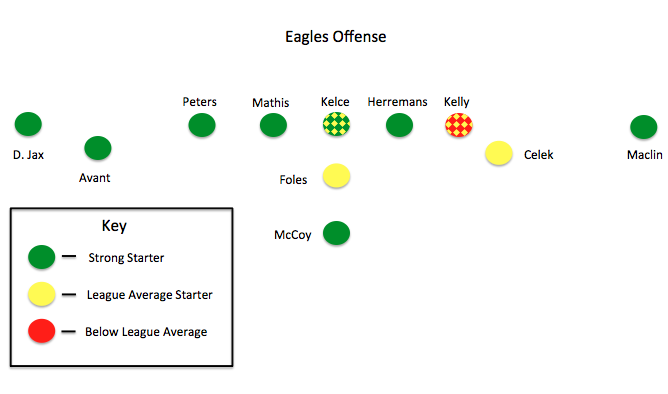 Overall, a pretty good lineup, and the biggest reason why the Eagles have a chance to rebound quickly from this year. Much more to debate here, but at the very least, there is far too much red in this picture. – Kendricks gets a rainbow because he’s shown signs of being everything from a scrub to a pro bowler. I think it’s likely he ends up as a slightly above-average LB, maybe more, but he has some big weaknesses that could hold him back. 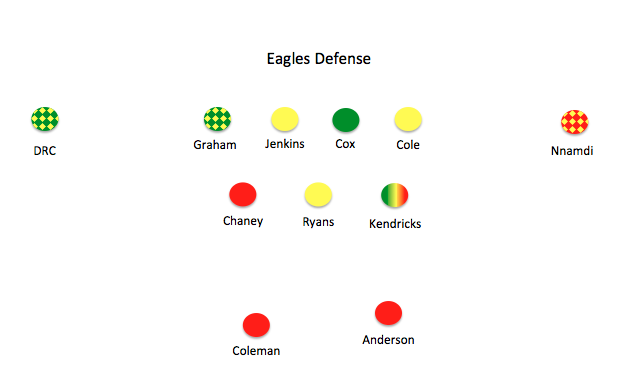 – Can’t believe Nnamdi gets the yellow/red, but there’s really no way around it after the season he had. Maybe he bounces back, but it won’t be for the Eagles. – This is the first time since 2006 that Cole doesn’t grade as well above-average, but he had a very quiet year. Showed very little ability to beat his man one-on-one (which he used to be great at.) Let’s hope it was a fluke, but at age 30 (31 next year) that may be wishful thinking. Now look at both pictures and it should be pretty easy to see why I’d like the Eagles to use the #4 pick on the best defensive player available (hopefully the DT.) As nice as a stud OT would be, the talent level on defense is far too low. Unfortunately, there’s no top safety or corner this year, so we could be looking at a trade down situation. New coach might like to make a splash with such a high draft pick, but the best way to build the team could very well be moving down, picking up extra picks, then drafting a safety/lb/corner where it makes sense. It’d be a very unsatisfying use of the #4 overall pick, but then again, watching a similarly bad defense next year would be far worse than unsatisfying.